Sales of concrete pavers and slabs rose to a projected 721 million square feet in the U.S. and Canada during 2016, a 4.3 percent increase from the prior year’s 690 million sq. ft. According to the 2017 Interlocking Concrete Pavement Institute Industry Sales Profile, based on a survey of producers representing more than 50 percent of U.S. and Canadian paver and slab capacity, last year’s estimated total was a) the highest since 2006, when estimated shipments hit 800 million sq. ft.; and, b) 35.5 percent above 2010, when the industry hit a recession-low sales point of 472 million sq. ft. Sales of all pavers in the U.S. climbed 5.5 percent during 2016, while Canadian sales declined 1.3 percent. Companies participating in last year’s survey had reported a 15.4 percent increase in the U.S. and 8.9 percent growth in Canada during 2015. In all, 77.7 percent of product from the 2017 Profile was delivered to the residential market. 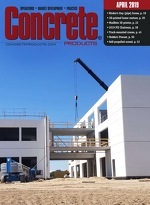 Survey findings indicate that continued low interest rates and energy costs, a slight increase in new home construction, modest growth in infrastructure investments by the public sector, and increases in commercial construction all contributed to the growth of the U.S. segmental concrete pavement industry in 2016, while Canada presented a mix of growth or slight contraction depending on the region. The full 2017 ICPI Industry Sales Profile is available to Institute members ($99) and nonmembers ($505) through the ICPI Online Store, www.icpi.org/shop. In the U.S., concrete paver sales expanded 4.5 percent, while sales of units designed for permeable interlocking concrete pavement (PICP) applications increased 20.2 percent. This represents a combined increase of 5.7 percent from an estimated 595.5 million sq. ft. in 2015 to approximately 629.4 million sq. ft. for 2016. In Canada, sales decreased 1.5 percent for concrete pavers and 9.1 percent for units designed for permeable applications during 2016. The combined decrease was 2.4 percent, from a projected 94.3 million sq. ft. in 2015 to approximately 92 million sq. ft. in 2016. Only paving slab (5.0 percent) and concrete grid paver (1.1 percent) sales increased in Canada during 2016. In all, 62.6 percent of PICP was used in commercial and municipal projects, while 37.4 percent was sold in the residential market. The market share of residential PICP sales increased 6.0 percent during 2016. Paving slab sales grew a combined 9.6 percent in the U.S. and Canada, with U.S. sales leading the way at 13.0 percent. In all, 25.9 percent of paving slabs was sold to commercial, municipal and industrial applications, up slightly in 2016.